Affliction Entertainment was an American mixed martial arts (MMA) promotion company created by Affliction Clothing in 2008. The UFC prohibited its fighters from wearing Affliction clothing after learning Affliction was applying to become an MMA fight promoter. Donald Trump, who owned a significant equity stake in Affliction Entertainment, was often seen sporting Affliction T-shirts at the PPV events. Although the promotion company bore the Affliction name, it was run independently of Affliction Clothing. In July 2009, Affliction announced that it would exit the fight promotion business and that Affliction Clothing would become a UFC sponsor. Affliction Entertainment promoted two pay-per-view (PPV) MMA events. The third (Trilogy) was scheduled for August 1, 2009, but was canceled July 24, 2009 due to Josh Barnett testing positive in the pre-screening drug test. On July 24, 2009 it was announced that Affliction had folded their MMA Promotion and would sponsor the UFC once again. Affliction entered the world of MMA fight promotion with the announcement of its event Affliction: Banned which took place on July 19, 2008 in Anaheim, California at the Honda Center. The card at Banned featured many of the top MMA heavyweight fighters. The main event was the return of Pride FC Heavyweight Champion Fedor Emelianenko fighting against former UFC Heavyweight Champion Tim Sylvia. Emelianenko submitted Sylvia thirty-six seconds into the first round to win in convincing fashion. The event saw victories by former UFC Heavyweight Champions Andrei Arlovski and Josh Barnett and former UFC Light-heavyweight Champion Vitor Belfort. Affliction's total attendance (14,832), with a paid attendance of (11,242) and live gate of ($2,085,510) The total disclosed payroll for the event was $3,332,100. Affliction: Day of Reckoning was the second event by Affliction and took place on January 24, 2009 in Anaheim, California at the Honda Center. The main event featured Fedor Emelianenko against former UFC Heavyweight Champion Andrei Arlovski. Josh "Babyface Assassin" Barnett fought on the card and defeated Gilbert Yvel. In a light-heavyweight match former Strikeforce Champion Renato "Babalu" Sobral beat Rameau Thierry Sokoudjou. Matt Lindland was reassigned from a 195-pound catchweight bout with Sobral to a middleweight matchup against former UFC Light-Heavyweight Champion Vitor Belfort. Headlining the undercard, which was broadcast on HDNet Fights, the first and last IFL Light-Heavyweight Champion Vladimir Matyushenko lost to PRIDE veteran Antonio Rogerio Nogueira. Affliction: Trilogy was to feature a fight between Fedor Emelianenko and Josh Barnett as its headline event at the Honda Center in Anaheim, California on August 1, 2009. On July 22, 11 days before the scheduled event, the California State Athletic Commission announced it would not license Barnett because he tested positive for a banned substance. Later that day, the CSAC issued a press release which stated that anabolic steroids was the substance detected in Barnett's drug test. Many of the fighters on the card were able to find another promotion to work for shortly after Affliction Entertainment's demise. The Renato Sobral vs. Gegard Mousasi bout was moved to Strikeforce: Carano vs. Cyborg for Sobral's Light Heavyweight Title, while Jay Hieron fought Jesse Taylor on the same card. Zuffa also picked up several fighters with the LC Davis vs. Javier Vasquez bout being moved to WEC 42, the Mark Hominick vs. Deividas Taurosevicius bout being moved to WEC 43, the Ben Rothwell vs. Chase Gormley bout moved to UFC 104 and Vitor Belfort main eventing UFC 103. As well Paul Daley, Dan Lauzon, and Rafaello Oliveira have signed contracts with Zuffa. The vs. Rob Broughton bout was moved to M-1 Global Presents Breakthrough. While Lucio Linhares from the other M-1 Global bout was also moved to the card, with a new opponent, he ended up fighting Mikhail Zayats. ^ a b Kevin Iole. "Affliction folds promotion, will sponsor UFC". Yahoo!. Archived from the original on 2012-03-17. Retrieved 2018-04-20. ^ Josh Alper (2008-06-05). 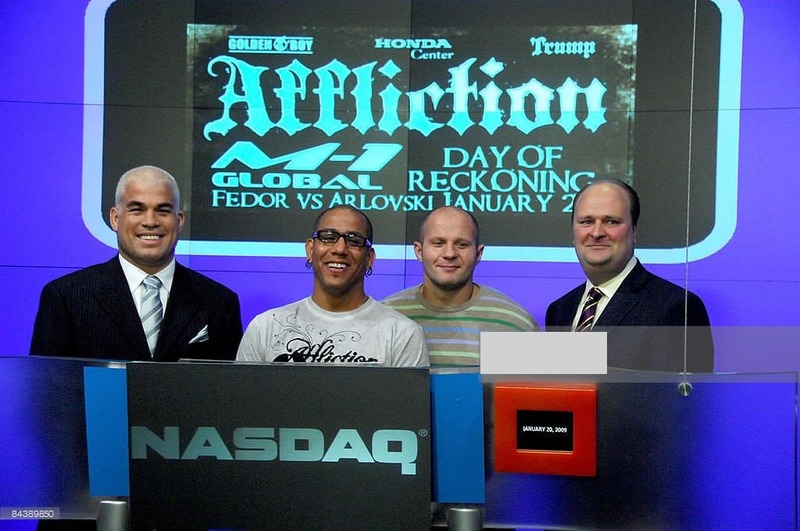 "Donald Trump Buys Stake in Affliction, Signs Andrei Arlovski and Wants Tito Ortiz". MMA Fighting. Retrieved 2018-04-20. ^ Scott Harris (2016-10-17). "Donald Trump's Failed Foray into the World of MMA". Bleacher Report. Retrieved 2018-04-20. ^ Clow, Kenneth E.; Baack, Donald (2012). Cases in Marketing Management. SAGE Publications. p. 115. ISBN 978-1-4129-9603-7. ^ Sherdog.com (November 14, 2008). "Affliction Owner Resigns". Sherdog.com. Retrieved December 26, 2008. ^ Kevin Iole. "Affliction folds MMA promotion, will sponsor UFC". MMAJunkie. Archived from the original on 2012-06-20. Retrieved 2009-07-24. ^ "Confirmed: "Affliction: Trilogy" event canceled". MMAjunkie.com. July 24, 2009. Archived from the original on 2012-06-20. Retrieved July 24, 2009. ^ "Fedor Emelianenko vs. Tim Sylvia Set To Be A Title Match". 411mania.com. June 14, 2008. Archived from the original on September 7, 2008. Retrieved December 26, 2008. ^ Bigelow, Dirk (January 17, 2009). "At first look, "Affliction: Banned" draws 14,832 for $2.1 million gate". MMAjunkie.com. Archived from the original on 2009-01-10. Retrieved December 26, 2008. ^ Bigelow, Dirk (January 17, 2009). "Affliction: Banned" official salaries: payroll tops $3.3 million". MMAjunkie.com.com. Archived from the original on 2009-01-10. Retrieved December 26, 2008. ^ Hamlin, Tom (September 10, 2008). "Affliction VP Tom Atencio on "Rescheduling"". Mmaweekly.com. Archived from the original on 24 December 2008. Retrieved December 9, 2008. ^ "Affliction Releases TV Line-ups for HDNET & PPV". Mmaweekly.com. December 17, 2008. Archived from the original on 2008-12-19. Retrieved December 18, 2008. ^ a b Hunt, Loretta (December 11, 2008). "Sobral-Sokoudjou Announced for Affliction 2". Sherdog.com. Archived from the original on 13 December 2008. Retrieved December 12, 2008. ^ Fagan, Mike (August 4, 2008). "Rogerio Nogueira and Vladimir Matyushenko at Affliction's October Show". Bloodyelbow.com. Retrieved December 9, 2008. ^ Caplan, Sam (January 28, 2009). "Atencio says next event could happen in July or August; leaning towards Fedor vs. Barnett". Fiveouncesofpain.com. Archived from the original on 30 January 2009. Retrieved January 28, 2009. ^ "Affliction's third event takes place Aug. 1, Emelianko vs. Barnett headlines". MMAjunkie.com. May 21, 2009. Archived from the original on 2009-05-25. Retrieved May 21, 2009. ^ "Confirmed: Barnett Out of Fedor Fight". sherdog.com. May 21, 2009. Retrieved July 22, 2009. ^ "California State Athletic Commission Denies License to Josh Barnett Press Release". MMAWaves.com. Retrieved July 22, 2009. ^ Morgan, John. "Renato "Babalu" Sobral to defend Strikeforce title against Gegard Mousasi on Aug. 15". MMAjunkie.com. Archived from the original on 2009-07-31. Retrieved 2009-07-31. ^ Marrocco, Steven. "Jay Hieron vs Nick Diaz for Strikeforce Title". MMAweekly.com. Archived from the original on 2009-08-01. Retrieved 2009-07-31. ^ Rossen, Jake (2009-07-31). "White Hosts Conference, Talks Belfort, Affliction, and Return of Ortiz". Sherdog.com. Retrieved 2009-07-31. ^ "Previously booked Jessie Gibbs vs. Rob Broughton bout secured for "M-1: Breakthrough"". MMAJunkie. August 11, 2009. Archived from the original on 2009-08-14. Retrieved August 11, 2009. ^ "Fedor vs. Mousasi Exhibition added to "Breakthrough"; Mark Kerr steps up to fight "King" Mo Lawal". M1 Global. August 10, 2009. Archived from the original on 2009-08-14. Retrieved August 14, 2009.